Make your practice more efficient and effective with Wellx. How much time do you and your staff spend on the phone, trying to contact patients about results? How many voicemails and missed calls does it take to let them know about referrals? 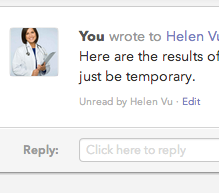 With Wellx, you can notify patients about results or referrals immediately by sending them a private message. You can include your own comments and attach a copy of the report or the instructions for their test. Everything you share via Wellx is permanently available to patients as a record about their health. 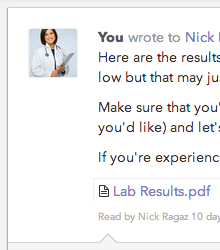 Doctors who use Wellx love this feature: after you send a message to a patient, you can see if and when they've read it. It's easy for people to miss an email. If you're sending them important information about their health, you need to know it's been received. Plus, until a message is read you can edit or delete it. Why are you still stuffing envelopes to send information to your patients? 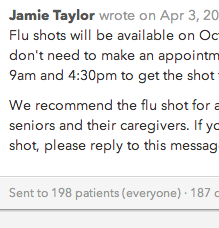 On Wellx, you can send a broadcast to your entire practice as quickly as messaging one person. Then you can track how many patients have read the broadcast and who's replied. It's a faster, easier way to organize flu shot clinics, distribute newsletters or send screening reminders – and you never need to worry about privacy breaches. Collaborate to reduce your workload. Everyone in your practice plays a part in communicating with patients. So why should you be the only one who responds to email? Wellx is designed with teamwork in mind. 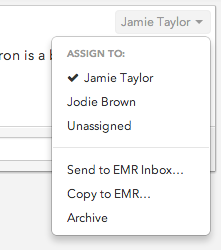 You can choose who's responsible for reviewing new messages and assign messages to another team member for follow-up. Wellx helps to ensure a faster response to the patient and a more productive workday for you. No support costs or hassle. Hosting: We host Wellx in a secure, managed environment. All you need is a computer with internet access (or your tablet or mobile phone). Phone and email support for you and your staff: You can call us anytime you're having problems. You'll be connected directly to our programmers, so we can troubleshoot and fix your problem in real time. Email support for your patients: We don't want you and your staff to have to deal with patients who've lost their password or need help with the site. We're happy to take patient support requests via email.